Hazard: The grills’ LP regulator can allow gas to flow at a higher pressure than intended, which can result in a gas leak and flame burst from the burner knobs, posing fire and burn hazards. Description: This recall involves the SABER grill models, warranty part kits and a conversion kit listed below that contain a Model RA329 LP regulator with a date code in the range of 1120-1344. The model number of the grill is located on a rating label located on the underside of the grease tray. The regulator model number is on the center of the regulator, and the regulator date code is stamped on the regulator adjacent to the gas tank connection. 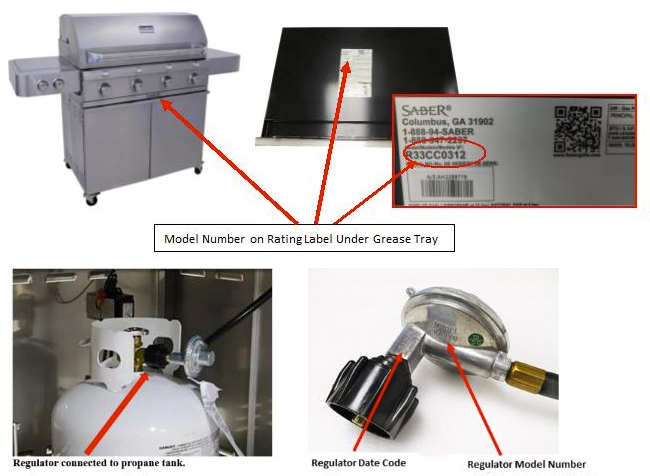 Remedy: Consumers should immediately stop using the recalled grills and regulators and contact Saber Grills for a free repair kit and installation instructions. 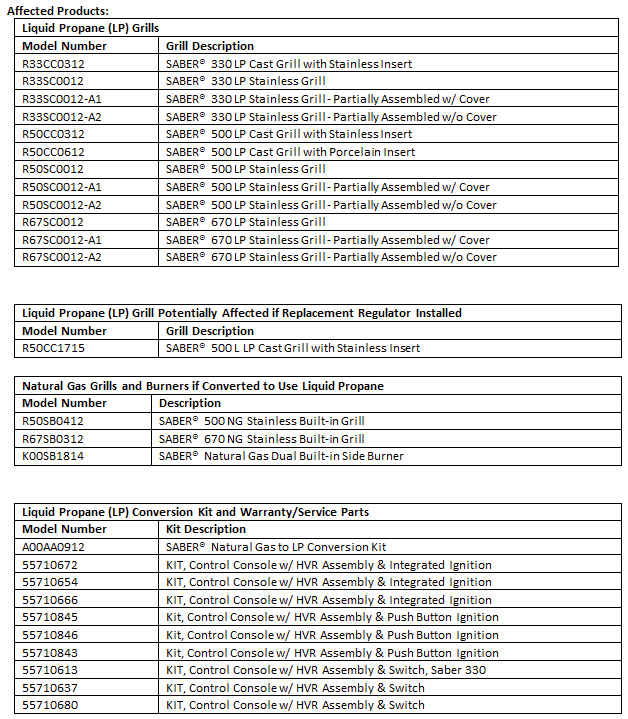 Consumers with a built-in SABER natural gas grill (Model SS 500 BI or SS 670 BI) or with an add-on Side Burner (Model K00SB1814) that has been converted to use liquid propane instead of natural gas with a recalled regulator should contact Saber Grills for further instructions. Before you order your repair kit, you will need to conduct a simple test to determine which repair kit is appropriate for your grill. Please see the Consumer Test Procedure. Instructions for the two types of repairs are available below. Videos on how to conduct the two types of repairs are available below.